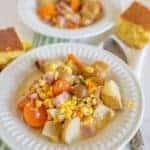 Simple slow cooker potato and corn chowder made with simple ingredients you already have in the pantry, and it’s packed with flavor. This is one of my favorite slow cooker recipes and it’s for a good reason! 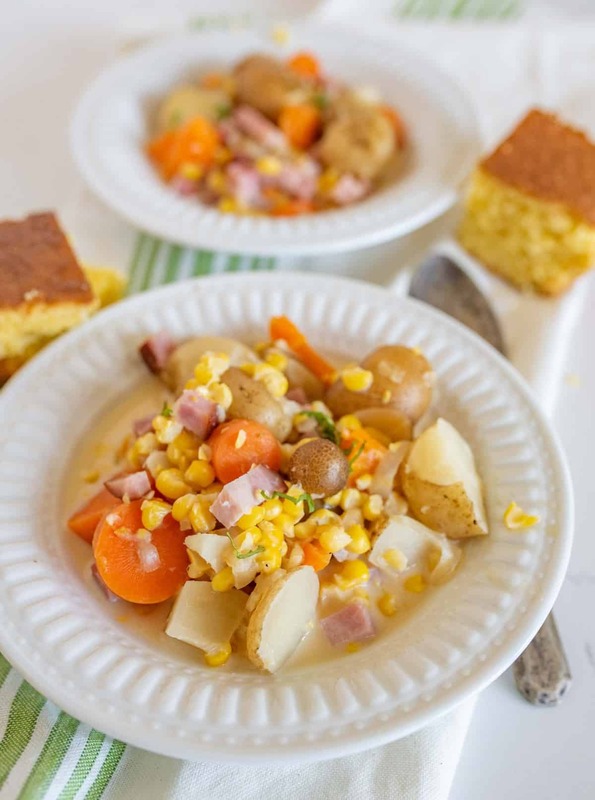 Potato corn chowder is so easy to make, your whole family will love it, and it’s easy on the budget. It’s creamy without being heavy, it’s full of veggies, and it packs a lot of flavor, thanks to the ham, without costing an arm and a leg. I also love this recipe because I happen to grow a whole lot of what’s in it. I LOVE meals that I can make with things from the garden. I grew the corn, potatoes, and carrots you see in the picture and I made homemade chicken stock from chickens we raised for the freezer last fall. If that isn’t homesteading in a bowl, I don’t know what is! My mom made a recipe really similar to this when I was a kid and I assume it was for the same reasons – everyone loves it and Dad grew most of what she needed in the garden. 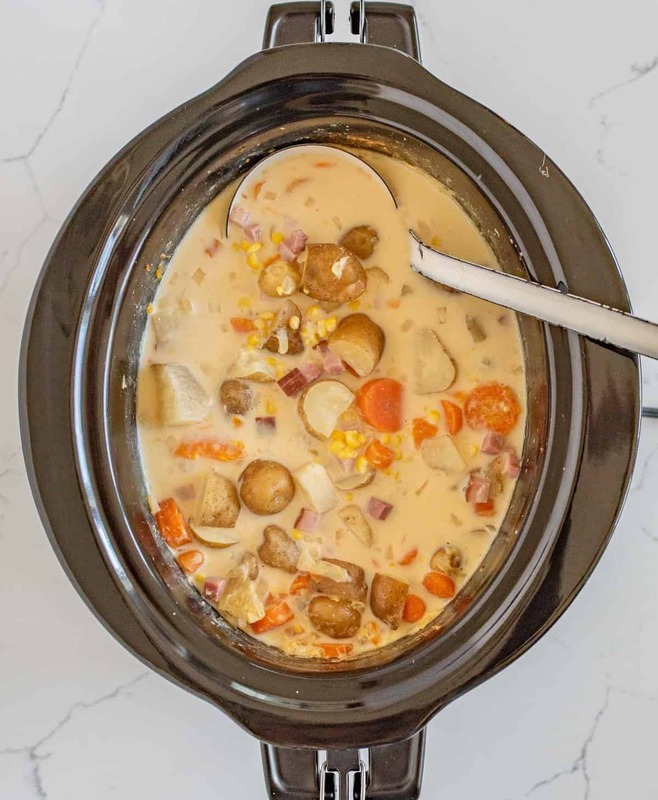 This is a recipe that I always take to gatherings when asked to bring a pot of soup because it always hits the spot and isn’t much work on my part. I also love it that the creaminess just comes from a can of evaporated milk. I don’t always have cream in my fridge but I always have some canned milk in the pantry. That makes this a really easy meal to throw together and have cooking away in the slow cooker when life gets busy. 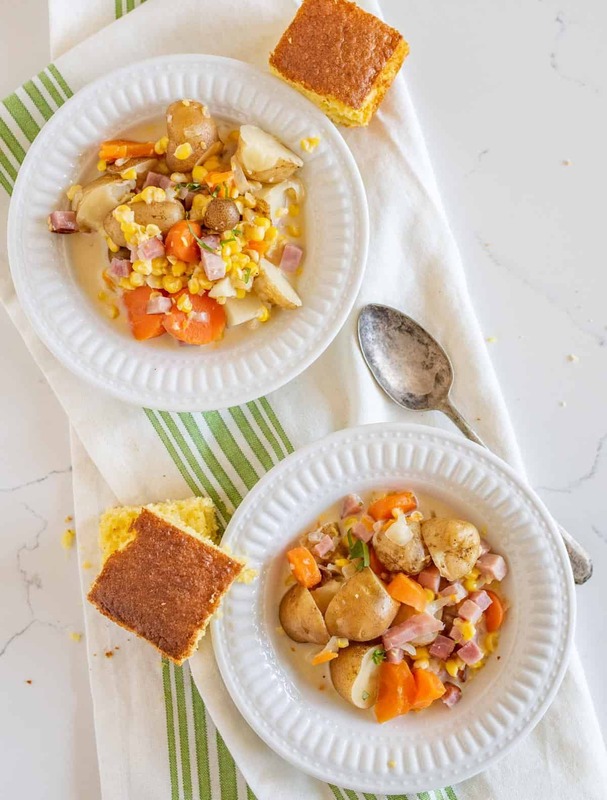 I like to take potato corn chowder to new moms and sick friends or neighbors, too, because it’s simple but everyone likes it. It’s one of those recipes that you make over and over again and eventually stop using a “recipe” all together. You just toss stuff in your slow cooker and let it do it’s thing. It’s taken me so long to share because I had to stop and figure out the measurements so that I could share it! When you add the chicken stock, it should be within an inch of covering the veggies if not completely covering them. Add more stock as needed to get it up to that level (you can also add a bit of water and just adjust the salt and pepper to taste). You can use any potatoes you like, even super small new potatoes as long as they are 1 to 1 ½ inches in size to ensure even cooking times. Peel them or leave the skin on – either works just fine. Don’t love ham? Try adding 2 medium chicken breasts in with the veggies and broth at the beginning of the cook time. Pull them out just before you add the evaporated milk or cream. Shred the chicken and add it back to the slow cooker when you add the milk or cream. 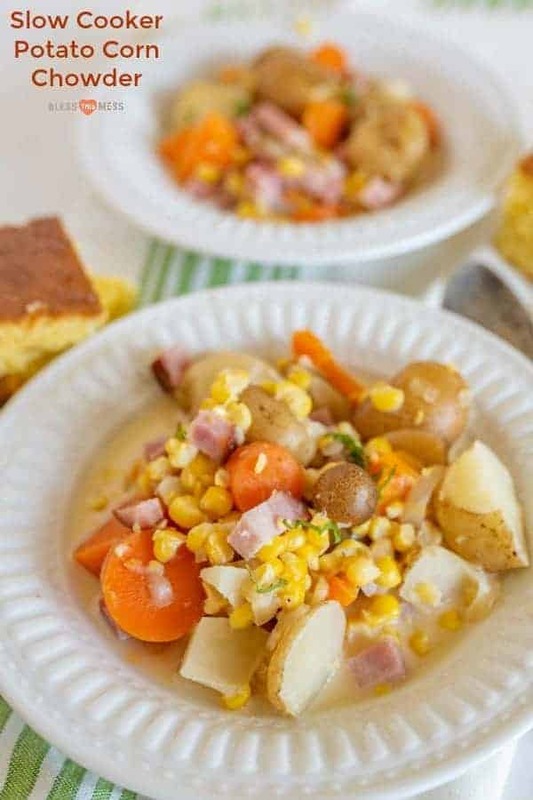 Serve this with a side of my favorite sweet Cornbread Recipe and you’ll have yourself one awesome meal. I have this slow cooker and love it. My favorite part is that the lid clamps on! Once you lose a batch of slow cooker meatballs in the back of your car, you’ll never get one without a clamp-on lid again. 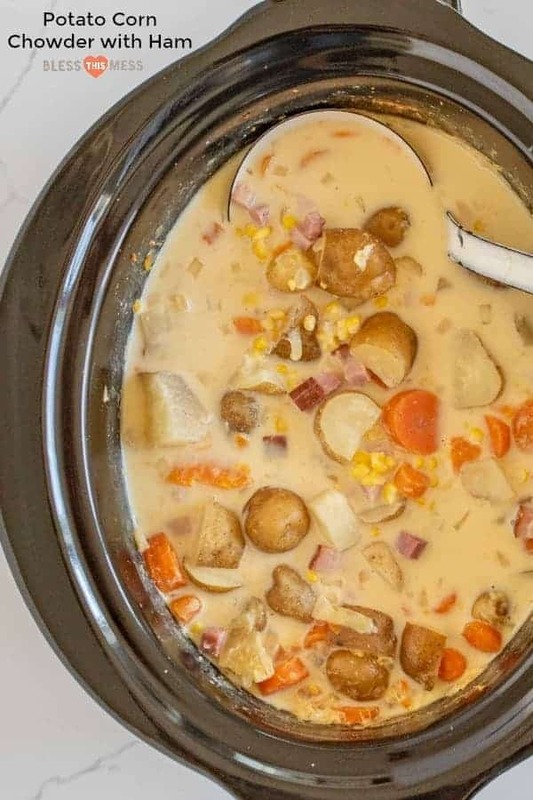 Add the carrots, potatoes, onion, and corn to the base of your slow cooker. Add the chicken stock and stir well to combine. Cook on high for 4-5 hours or low for 6-8 or until the potatoes and carrots are cooked through. 15 minutes before serving, add the evaporated milk or cream, salt, garlic powder, and cubed ham. Stir well to combine. Let the mixture cook for an additional 15 minutes before serving hot with additional salt and pepper to taste. You can use any potatoes you like, even super small new potatoes as long as they are 1 to 1 ½ inches in size to ensure even cooking times. Peel them or leave the skin on. Don’t love ham? Try adding 2 medium chicken breasts in with the veggies and broth at the beginning of the cook time. Pull them out just before you add the evaporated milk or cream in. Shred the chicken and add it back to the slow cooker when you add the milk or cream. 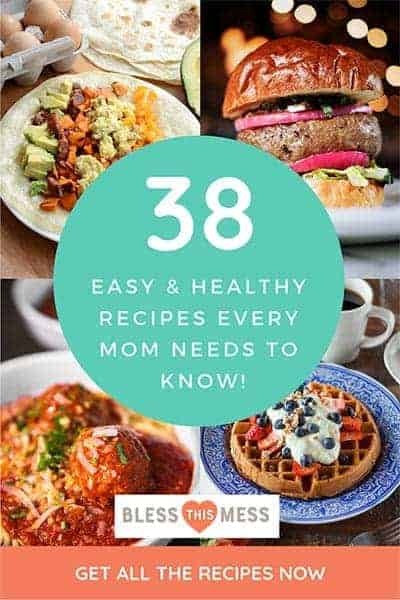 This is a recipe that I make over and over again because it’s easy and cheap, and I almost always have everything on hand to make it. Plus my kids eat it really well, too. 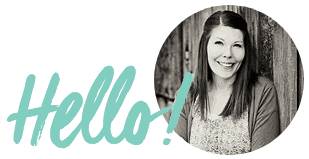 What’s not to love about flavorful slow cooker recipes that the whole family eats?! I can’t wait for you to try this one.